Yesterday, it hit almost 100 degrees where I live. ONE HUNDRED. I get that for some places, like Arizona, that’s nothing, but for New York City it’s a little outrageous. We just don’t know what to do with ourselves! And I certainly have no idea what to make for dinner. Even turning on the stove for fifteen minutes to make a stir fry has me wiping sweat off every inch of my body and my husband complaining that I’ve turned our tiny fifth floor walk-up into an oven. My solution to this constant struggle has been sandwiches. Lots of sandwiches. Generally, they require minimal, if any, stove time and they’re pretty fast to throw together. We’ve been getting bored of the usual summer staples, though (there’s only so many ways you can make a caprese sandwich, am I right? 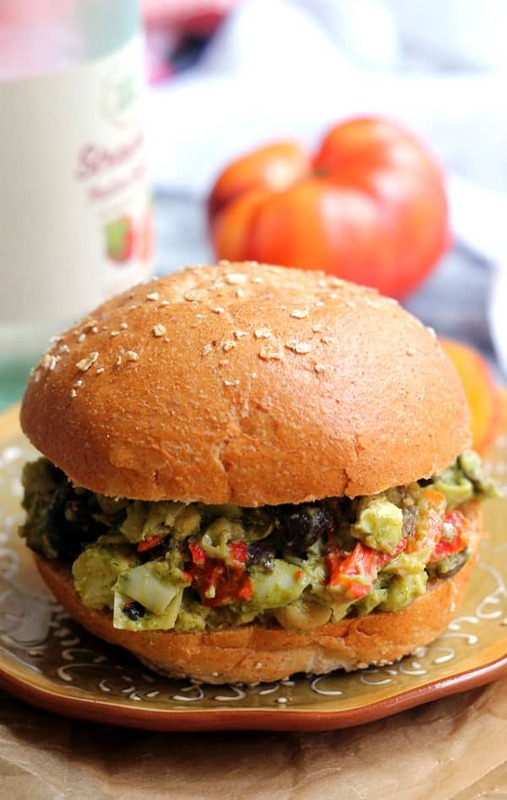 ), so I’ve made it my summer mission to vegetarianize some deli sandwich classics. As far as I see it, when you’re trying to turn a meat-filled recipe vegetarian, you can either attempt to mimic the original as closely as possible OR you can take the base concept and go crazy with it. I was never really that into chicken salad in the days before I stopped eating meat, so I had no qualms about ditching convention and giving it a unique summer twist. First, I replaced the shredded chicken with coarsely mashed chickpeas, the two of which have a pretty similar texture. Then, because dousing anything in globs of mayo makes me antsy, I used pesto as a sauce and stirred in roasted red peppers, artichokes, and olives to tie the whole salad together. In the end, this chickpea salad is full of fresh Mediterranean flavor, and is just as delicious served as a stand-alone salad as it is piled between two slices of bread for sandwiches. Made entirely from pantry ingredients, it can be thrown together in no time and requires absolutely zero stove or oven use, making it the perfect lunch or dinner option for summer’s hottest days. This easy chickpea salad is great in sandwiches, folded into lettuce leaves, or on its own! This salad can be eaten on its own or as a sandwich topping. I added fresh heirloom tomato slices to top off my sandwiches, but grilled or roasted veggies would also be a great addition. 100 degrees is actually RIDICULOUS. I would die and just lie comatose all day long haha. I live in Southern California so we usually get some hot weather, but this summer has been unusually colder than normal. Love how easy and delicious this recipe looks! Haha right!? It was rough, but this chickpea salad definitely saved me when I didn’t feel like turning on the oven! Chickpea salad is one of my favorite quick lunch options! This version looks fantastic. Definitely perfect for 100 degree heat! Thanks Maryea! I love that it didn’t require any oven time at all. Definitely a perk! 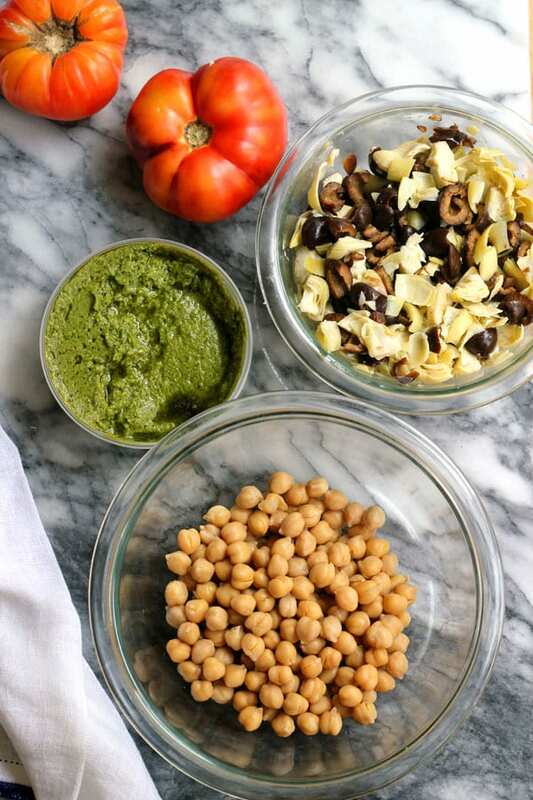 I put together the Mediterranean Pesto Chickpea Salad today for the first time today for lunch! Yummy! I made homemade pesto first from basil in my garden and used kalamata olives because that’s what I had on hand. Looking forward to enjoying this all week with fresh tomatoes! So glad you enjoyed it! Love that you made it with basil from your garden – that’s even better! I love this recipe. It’s not only great for hot days, but the ingredients all have a decent shelf life, so you can keep them on hand for when you absolutely don’t feel like cooking. The only thing I do differently is add lemon juice. I find it to be a must.